Gratitude, Victories, and 2018, here we come! As 2017 comes to a close, it is with deep gratitude and inspiration that we reflect on the challenges and victories from the past year. Together with our partners from across California and throughout the U.S., domestic worker leaders organized and continued to build power. Despite fear and amidst attacks against immigrants, women, and workers, we asserted our rights and won protections for our communities. Please see the video below of our collective 2017 victories and get ready for a new year of building immigrant women worker power and growing our movement together. We can’t wait to take on 2018 together with you. 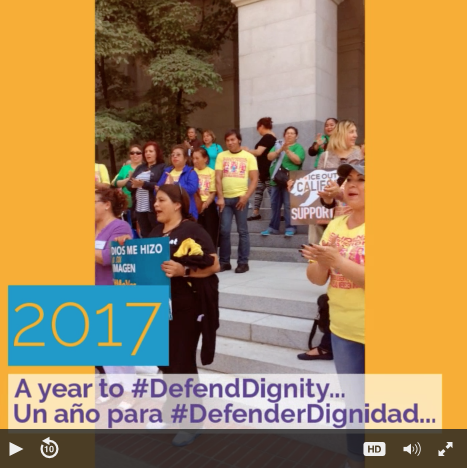 2017 with the California Domestic Workers Coalition!